Chane ka saag or chane ka saag ka chokha has a wonderful complex flavour even though the recipe is quite simple. The complexity in the flavour is attributed to the mineral content of the leaves of chickpeas which taste savoury with a rich mineral taste when eaten raw. This saag recipe will leave you spellboud with its simplicity and complex flavours. Sadly, chane ka saag (leaves of chickpea plants) is not so common in the cities possibly because it needs some time to sort and clean before being cooked. Most people are busy with work and with nonsensical things too sometimes and consider the time spent on preparing food as a waste of time unfortunately. I have overheard some interesting conversations in the weekly vegetables market in my area when people talk about how they would want to eat the greens but wonder who will clean them. And then there are the vegetable vendors who come with a chopping instrument to cut the green right there for their costumers, but only spinach and mustard greens can be chopped like that because they are long stemmed and come in bundles, sometimes even methi greens. I wouldn’t ever think of getting my greens chopped like that, without cleaning them thoroughly in my own kitchen. Such pre-chopped greens loose all their flavour and of course the nutrients when they are rinsed in water before cooking so best to be avoided. Smaller leaves take time to sort and clean and that is the reason chane ka saag is not so popular despite being one of the tastiest green vegetable. I have realised getting older now, that this kind of time spent on preparing food is quite meditative in nature and ensures healthy delicious food for the family. Chane ka saag is not grown for the leaves primarily but is a byproduct of growing chickpeas. In the vegetative growth phase, before the flowers set in, the growing tips of chickpea plants are pruned regularly to make the plants bushier so it can bear more flowers and chickpea pods. In the rural areas and smaller towns, many women will be seen selling really fresh chane ka saag that they have plucked the same morning, so fresh that it is eaten in its raw form as well, just like a green snack. The taste of the fresh chane ka saag is savoury with a complex mineral punch on the palate, many people Just munch on the fresh chane ka saag by the handfuls and sometimes pound it with some salt and chilies for a coarse dry chutney. I have grown chane ka saag Just for the leaves many times in my garden. You need to soak some black chickpeas and burry them under 1 cm of soil in a wide pot, it helps if you crowd them together, and keep it in a sunny spot. The leaves emerge in 3-5 days and grow about 6-8 inches tall in a month or so. Harvest them all and use to make any of the chane ka saag recipes from this blog. 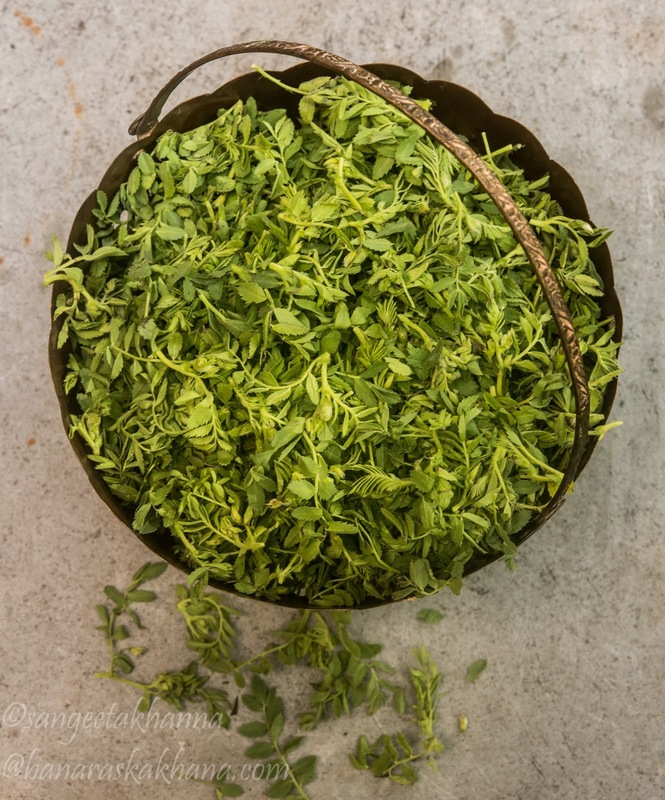 The whole plant except the base can be used in this case as it is tender and flavourful. I have memories of such snacks from the holidays we used to enjoy in my grandmother’s village and how some women used to collect chane ka saag in their Aanchal (free flowing part of the sari, used in multiple ways in rural India) and come home to sell the saag instantly. A few saagwali ladies still come to our Banaras home bearing a large cane basket on their heads every morning to sell freshly plucked chane ka saag or foraged Bathua ka saag during winters and I go berserk whenever I am visiting. I have already shared a few recipes of chane ka saag (saag is a generic name for all leafy greens as well as cooked leafy greens, used interchangeably) like this chane ka saag in a mustard gravy, chane ke saag ke pakode and chana saag dumpling curry, chane ke saag ka achar etc. 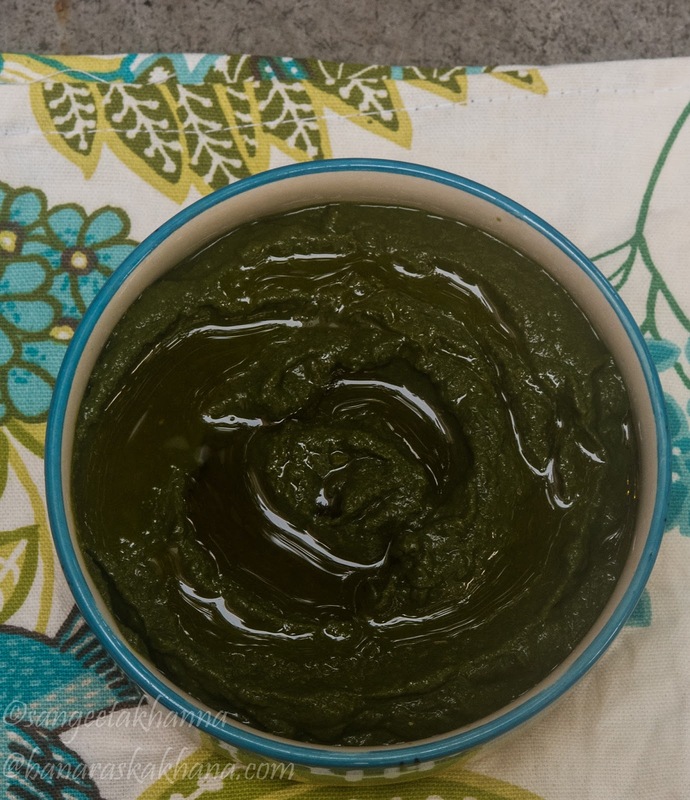 The recipe I am sharing today is called just as chane ka saag in my home but some other people, especially from Bihar, call it as chane ke saag ka chokha of chane ke saag ki chutney as this recipe can be consumed like chokha or chutney too. I have used this recipe as a dip and as a spread as well with wonderful results. This recipe of chane ka saag is so simple to prepare that you may feel like dismissing it in the first glance. But trust me the complex mineral taste of chane ka saag is enhanced so beautifully by the raw mustard oil and green chillies and garlic used in the recipe. 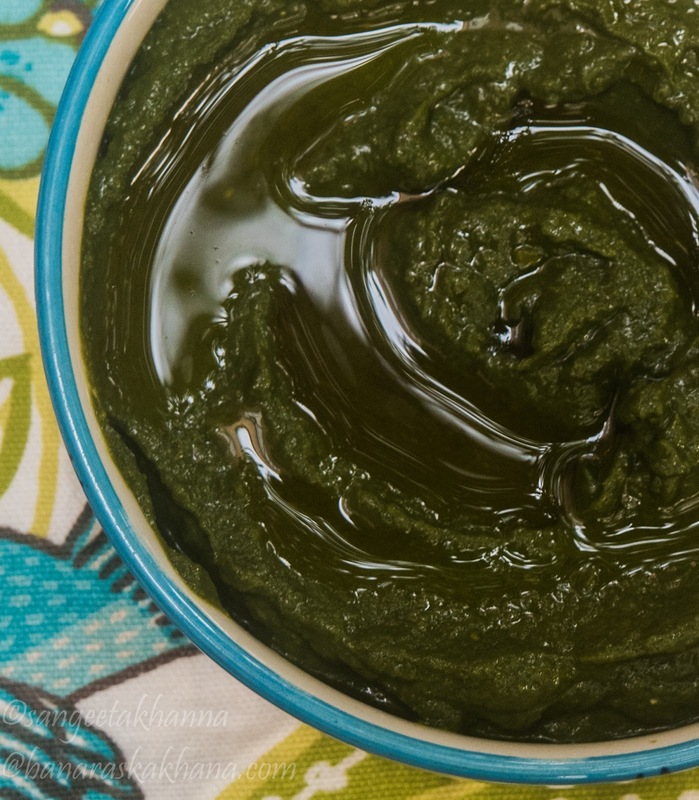 Some people tend to use the green garlic for this recipe but I avoid that because the taste of chane ka saag itself is so rich that it doesn’t need any meddling. But go ahead and use green garlic if you like, minor flavour variations make a big difference sometimes for individual palates. To clean chane ka saag you need to pluck the tips including tender stem and discard the hard stem, I prefer to shuck off all leaves from the hard stem too as this saag is so difficult to come by in the cities and is quite expensive too. This sorting of the saag takes some time and then you need to wash the leaves in several changes of water, I suggest you soak the leaves in a deep vessel for sometime so all the dirt settles down and then wash with several changes of water.You don’t need to chop the saag for this recipe. Boil the chane ka saag with water and salt in a covered pot for 4-5 minutes or till it wilts completely. Let it cool. Blend with garlic and chilies till smooth. Empty in a serving bowl and drizzle the mustard oil on top. Add the mustard powder while blending if using olive oil as a topping. Serve with Indian meals of dal and rice or roti along with other subzis. Many people including me mix chane ka saag with plain boiled rice or dal and rice and eat it, I have seen it being eaten like this in my family. I like it with crisp hot parathas as well and of course in many other ways as mentioned above. Chane ka saag remains one winter delicacy I look forward to every year. Try this if you get chane ka saag in your part of the world or grow some chickpea greens yourself just for this. It is worth all the effort trust me.